An “Upstairs, Downstairs” theme has been used by the Youngstown Garden Club to decorate Old Fort Niagara for the holidays. 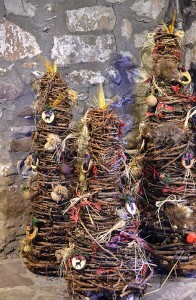 The decorations are woodsy and rustic to fit in with the architecture of the building known as the French Castle, built in 1726. The ornaments used in the officers’ areas are are fancier, embellished with satin ribbons and silver cording. You can see the decorations through Monday, Dec. 31. Hours are 9 a.m. to 5 p.m. daily. (The fort is closed on Christmas Day and New Year’s Day.) Admission is $12 for adults, $8 for children 6 to 12 years old and free for children under 6. Other discounts are available. 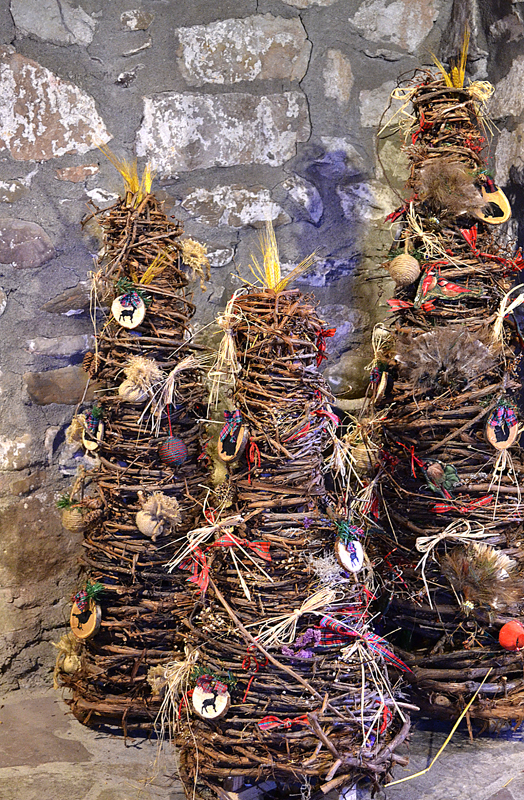 You can also see the decorations by candlelight during the fort’s annual Castle by Candlelight program from 7 to 8:30 p.m. Saturdays, Dec. 15 and 22. Historic characters will regale visitors with tales of Christmas from the 18th and 19th centuries. Demonstrations of 18th and early 19th century trades and period music will be performed. In the Castle’s Boulangerie (bakery), which is seen in the first photo, cooks will demonstrate the preparation of a traditional holiday feast, including wild game. The highlight of the evening will be a grand feu de joie (firing of joy), a traditional military ceremony involving running fire by muskets and artillery to mark a special occasion or victory. That will take place at 8:30 p.m.
Tickets to the Castle by Candlelight are $8 per person, and will be available at the door. Guests can arrive at the Fort Niagara Visitor Center at any time between 7 and 8:30 p.m. and are asked to dress for the weather, wear walking footwear, and bring a flashlight. Additional admissions stations will speed your entry this year. 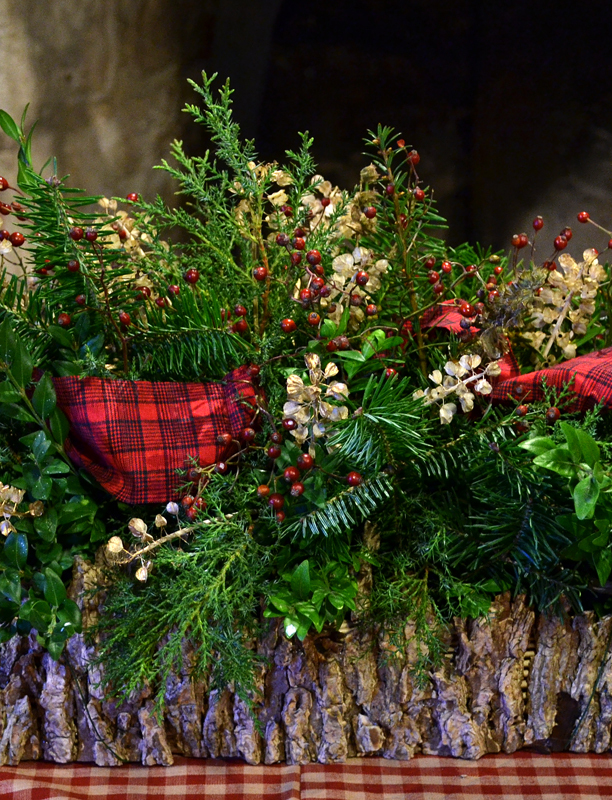 To prepare for decorating the fort, the Youngstown Garden Club held several workshops where members made ornaments and wreaths, explained Donna Gray, a member of the club and chairman of decorating for Old Fort Niagara. The co-chair is Marge McCollum. Many of the ornaments are disks cut from a branch of a cherry tree. The bark was left on. The club members stenciled a simple design on each. A hole was drilled into the disk and a ribbon was used to attach the ornament to a Christmas tree, swags, topiaries and other decorations. In the large photo at the beginning of this story, you can see an overview of the decorations in the kitchen, which incorporated the cherry wood ornaments, and in the second photo, you can see a closeup of the ornaments on a Christmas tree in a hallway. The third photo shows a close-up of the arrangement that’s on the table in the kitchen. Notice the small flowers. Those are grape hyacinths, a lovely spring flower that can really spread. The grape hyacinths were dried and spray painted.What a great use for a prolific flower! A trio of topiaries, which you can see at left, also decorate the kitchen. They started with wooden cone-shaped forms that were then wrapped in grapevine. 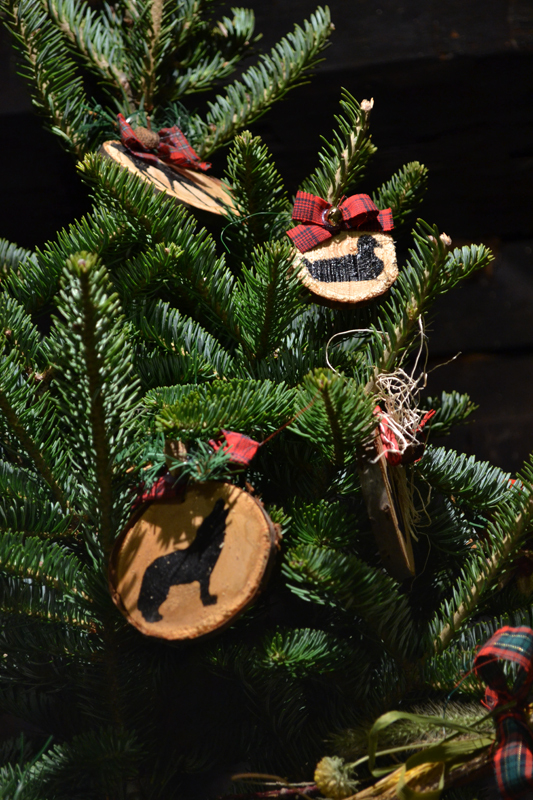 The cherry wood ornaments also decorate the topiaries. The fleur-de-lis ornaments, which you can see below, were made from mat board and hung with royal blue ribbon. Pine cones with silver ribbon and cording coordinate with the fleur-de-lis ornaments on a Christmas tree on the second floor. 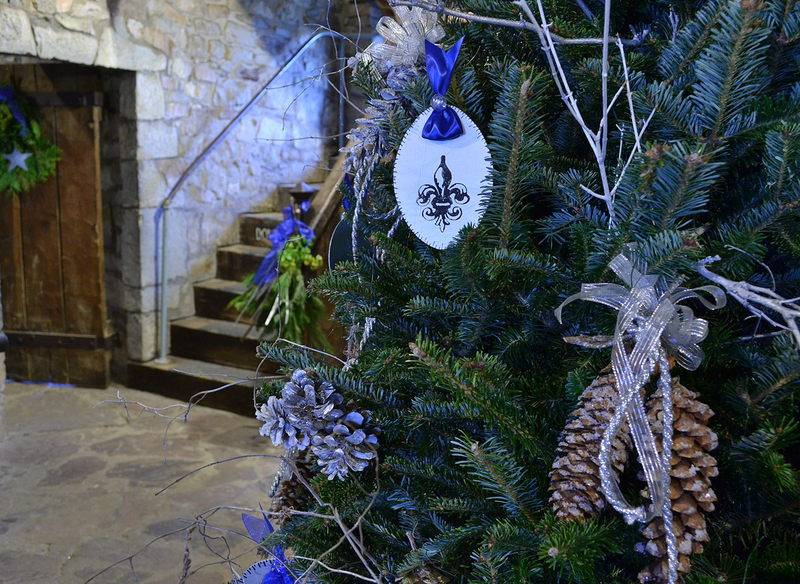 The Youngstown Garden Club was recognized previously by the National Garden Clubs, Inc. as first place winners in the category of “Decoration of Historic Building” for the club’s holiday decorating of the French Castle. 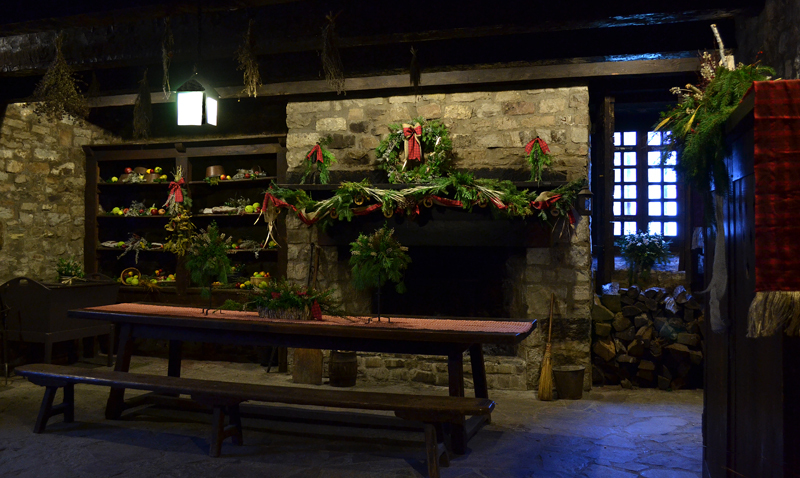 The aim of the be decorations is to make the fort feel festive for visitors at Christmastime, not to be historically accurate, explained Bob Emerson, executive director of Old Fort Niagara. This year marks the 200th anniversary of the beginning of the War of 1812, in which the fort played an important role. Christmas 1812, however, wasn’t a happy time at the fort. The war started in June, and the fort was bombarded in October and again in November. Even in years that didn’t see active combat, Christmas celebrations were very different from what we know today. Christians of the 1700s and early 1800s might have had religious celebrations and a big dinner on Christmas, but Fort Niagara was so remote that it was likely that the soldiers had neither. In the fort records, “You’d be hard pressed to find any mention of Christmas,” Emerson said. Instead, people of that time were more likely to hold celebrations twelve days after Christmas on Jan. 6, the Feast of the Three Kings or the Epiphany. In that tradition, a Twelfth Night Ball will be held from 7 to 11:15 p.m. Saturday, Jan. 5 in the at the Fort Niagara Officers Club (which is heated; the French Castle is not heated) at Old Fort Niagara. The event will include Georgian-era country dancing (with instruction), fine beverages and desserts.Tickets are $40 per person. Advance sale reservations are required and the event usually sells out. For tickets please call the fort office at (716) 745-7611. Lovely article Connie. I am planning my visit this week. It would be nice to go again for Castle by Candlelight.